OK winter is definitely here. I chickened out and put the central heating on a few days ago, and we may even fit the electric blanket soon. We have had a lot of rain recently, although with a few sunny days. We haven’t managed a picnic for what seems like ages! The library staggers on. We have collected a number of books recently from kind donors, and Janie at the chateau tells me that we now have enough, in fact more than enough. Just have to open a branch library! We went to a garden party raising funds for Macmillan cancer funds in September – a lovely sunny day and very enjoyable. Janie offered a night’s B & B at the chateau as a raffle prize, and we raised a good sum for this really good cause. Saw my Consultant regarding my leukaemia – it is standing still and she doesn’t want to see me for 18 months. Excellent news. Our new Clumber puppy Icare is settling in very well, in fact I am sure he now thinks he owns the place. We did library shift at the chateau a few weeks ago, and left him to have a wander around the grounds. After a few minutes he came trotting in with a pair of glasses carefully held in his mouth. He presented these to me very proudly! They turned out to belong to a previous guest at the chateau, who had look everywhere for them – he is now the toast of Pennsylvania! 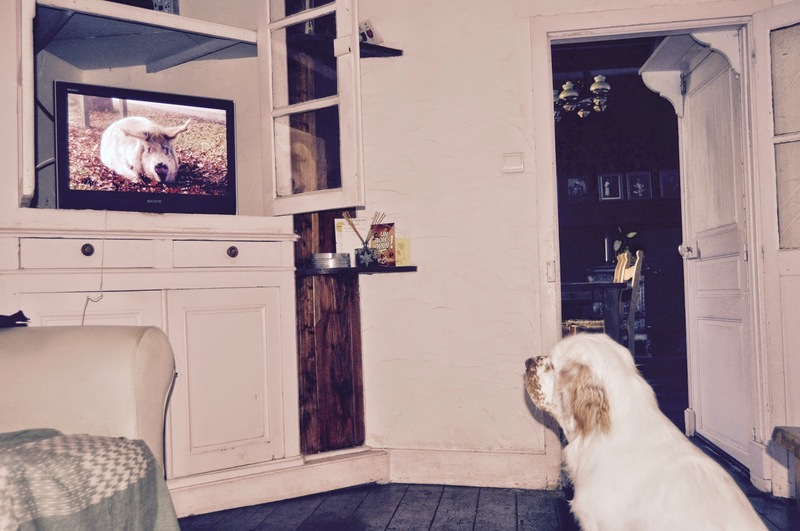 He also watches TV, especially if there are animals being shown, and he barks at other dogs that appear. We have carried on with our picnic days out – had a very nice day out near Tulle, and another near Rocamadour. On one of the days out I was keen to find the Chateau de Buzaneix, having seen a picture of a lovely little chateau surrounded by a moat. The description said it was not easy to find. We actually found the sign to it, indicating it was down a fairly rough track. We drove down this quite gingerly, to find that the place was very firmly closed and marked as private. Also there was nowhere to turn around, so we had to carry on down a track that degenerated even more. We emerged thankful we still had an exhaust! From there we went to the Chateau de Val, and from the number of car parking places, in the summer this is very popular, and with good reason. A lovely building on the edge of a beautiful lake. We also found some wonderful views over the upper Dordogne valley. A brief day out on my own was to meet up with someone selling a Flymo lawn mower, near Limoges Airport. I hope that it will make it slightly easier to curb our jungle, although it is still in our local garage being serviced. I was also able to visit an Asian supermarket near the airport, to stock up on some of the more exotic ingredients you can’t find in the local supermarkets. Just when I thought I would forget about my tiny business, I actually got a job. It was to do floorplans and photos for a large manoir just south of Limoges. Good fun and it seemed to go OK. The strange thing was the place was located only a kilometre or so from a breeder of Irish Wolfhound puppies we had visited a couple of months earlier. Apparently my nearest and dearest tell me that this is NOT a sign. But the pups are so cute…. Although we aren’t members of the Correze branch of the Franco British Chamber of Commerce and Industry any more we were invited to an event in Brive organised by the new person running it. We were to do some networking, socialise, eat and watch Brive play Gloucester in the second tier European rugby competition. It proved an interesting evening, held in a local sports centre. The networking and socialising went well, the meal took a very long time to order and by the time we finished eating, Brive were well on the way to losing by 55 points to nil, so we didn’t stay too much longer. Rachel very kindly gave me her old IPhone 4S, and it has only taken 5 months to get it working! Unfortunately when she finished her contract in UK it was locked, and apparently Orange is the most difficult network to unlock. Of course Orange France couldn’t do it, and, amazingly, neither could Orange UK. Eventually, with lots of help from Carol and Terry, I did get a working mobile. I checked the tariffs here, and found that for the amount I had been paying for my landline, internet and mobile – no calls included, I could pay 4€ more each month and get loads of free landline calls and mobile internet time. Got stung by a mosquito or other unpleasant flying thing a few weeks ago, and it had to be on the bottom joint of my ring finger. It swelled up beautifully, so visit to the doctor who gave me a prescription for loads of antibiotics and sent me straight to the jewellers to have my wedding ring sawn off – and that was fun! All back to normal now, and the ring has been repaired (slightly larger) and it is back in place. We are getting quite excited about visiting Rachel in New York over Christmas, more about all that next time!